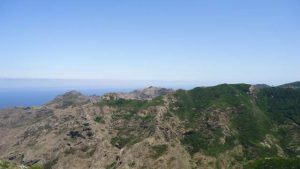 My tour from Almaciga to Benijo and Chamorga is one of many walks I have passed in the northern part of the Anaga mountain range. There are several variants of this tour, and I have passed them on various occasions. Here, I describe the shortest route which is convenient if you depend on the public bus transport. Please keep reading. The names in the title describe the places and locations you pass on this tour. In my case, this was after using the bus 946 from Santa Cruz. This is the only line, and it is from the south of the island. So, you will leave the bus at the last-but-one stop, which is on the road close to the sea before the bus turns up to the village and to its last stop, see the photo below. The start of the route below Almaciga. But do not worry if you miss this stop, you will be fine even if you continue to the last one; in this case, you will just descend to the road and continue to Benijo. So as you see, from Benijo you will follow a tiny path which goes roughly in the east direction (the red line in the map), and you will be gaining the altitude all the way up to the Cruz de Chamorga (this is the red marker on the map, and it represents the highest point of the route, at some 660 meters above the sea level). 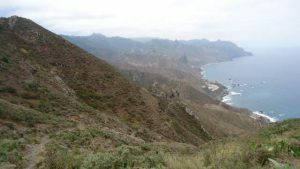 The most of the path from Benijo to the Cruz is with great views, only the final section is through the pleasant forest. 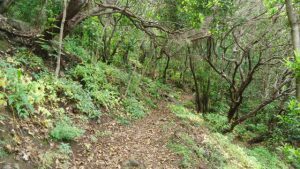 One option is descending directly to Chamorga, and you will be there in half an hour time by following a nice path through the forest. This is presented with the red line the map above. 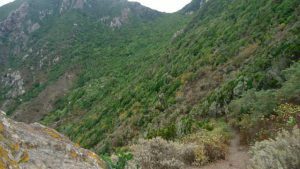 Yet another option is to continue along the ridge in the direction of Faro, and then from Tafaga to descend towards Chamorga. I warmly recommend to do so if you have time, this is only some 40 minutes extra time. This variant is shown by the blue line in the map. 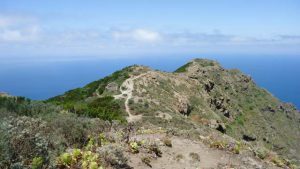 One small part of this route is described in my another text about the round tour Chamorga – Faro – Chamorga. 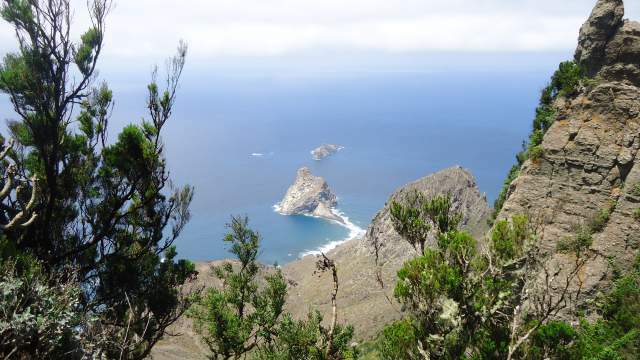 From Almaciga to Cruz de Chamorga (the highest point of the route, you will need around 90 minutes. In yet another 20 minutes or so, you will be in Chamorga. So all in all, plan around 2 hours for this tour. Make sure to be in time for your bus from Chamorga, check the time tables here. View back towards Almaciga and Benijo. Somewhere in the middle of the route. In the forest below the Cruz de Chamorga. This is a relatively easy tour, orientation is never a problem, and it is convenient if you use the public transport. So, you will arrive at Almaciga by the line 946, and from Chamorga take the minibus line 947 back to Santa Cruz. The public transport on the island is very good and reliable. Note, the route can be done the other way around, from Chamorga to Almaciga. This is easier because Chamorga is far above the sea level and most of the time you will be descending towards the sea. Just keep an eye on the timetables of the two bus lines. Regardless which direction you do, there are several variants of this tour, see some of them shown in the maps below. Ijuana in the distance – protected zone; click to read more. Tafaga hill above the Faro. 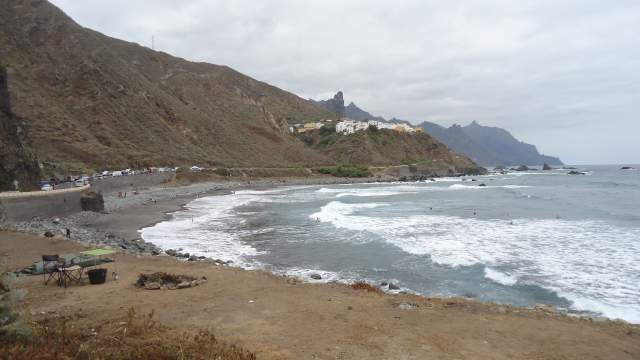 Roques de Anaga. Click to read more. Here, I give several possible variants (there are more). The variant below is suitable if you are using your own car. So you do a circular route, the first part is described in the basic route above, and the second part is a variant you will have to explore. 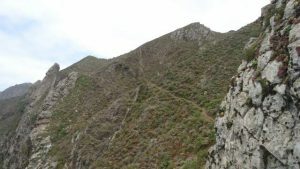 If you go in the clockwise direction, the north branch of this circular route may be a bit tricky to find after you pass Draguillo. So, I would suggest doing this route in the anti-clockwise direction, it should be far easier to find the path. 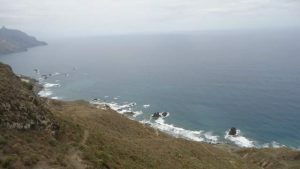 To conclude, I hope you have enjoyed my text about Almaciga – Benijo – Chamorga tour. I do not give photos of Chamorga, you can see them in my separate text. 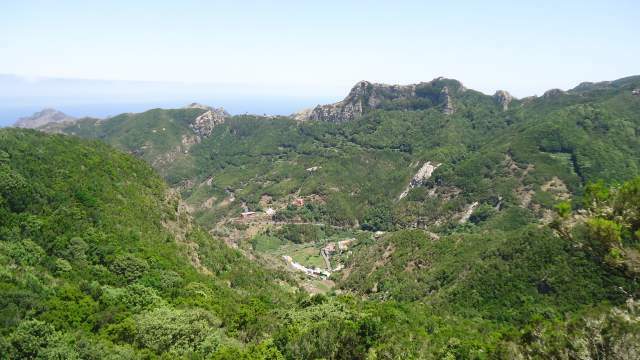 But in any case, do not miss to visit the village, this is the most remote place on the island. 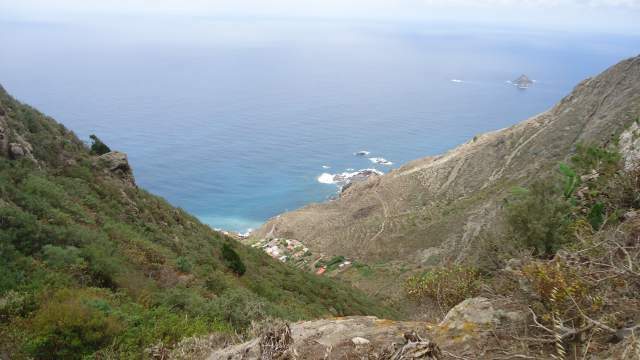 Do not underestimate this tour, you have to climb far more than 600 meters from the sea level. It will be great to hear from you, so do not hesitate to contact me in the case of questions and comments, there is a comment box below. There are many more hiking tours around and only a small part of them is presented in the site. I plan to add a few more, so stay tuned. Have a nice day. Hi. These are helpful suggestions. Hike to Chamorga from Igueste day 1 (have done before). Chamorga circuit via Roque Bermejo day 2. Chamorga, El Draguilo, Benijo day 3 to pick up a bus to San Andres. Does day 3 sound straightforward enough re route finding? Hi Noreen. I wonder where you would stay in Chamorga, there are just a few houses, no place to rent. Perhaps you plan sleeping outdoor, this is forbidden but I have seen people doing this. For the day 3, yes, just walk up from the bus station at Chamorga, there are signs to Draguillo right at the bus stop.